Associate LL.B. (Hons), Dip. L.P., N.P. 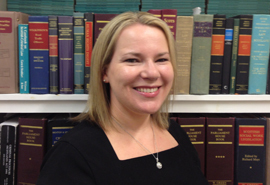 Nikki Fyffe is our child and family lawyer and is an associate of the firm. She also acts as a Notary Public. She deals with all aspects of family law and has a particular interest in residence, contact, interdict and children’s referrals. She brings a caring, diligent and intelligent approach to her work. As a result, she he is held in high regard, both by her peers and by the many clients she has successfully represented in her 15 years as a family law solicitor in Dundee.